I introduced you to Mike, my naval ensign friend, in this post. I’m continuing with tidbits from our emails leading up to the Fourth of July here. What will you do for Independence Day? Fourth of July should be fun. 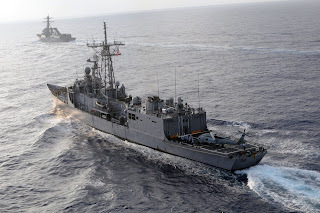 A Navy ship is a cool place to spend the holiday. We had what we call a “steel beach picnic” on the ship on Sunday. We’ll prolly have one of those for the Fourth. What is a steel beach picnic, exactly? What do you eat at an event like that? 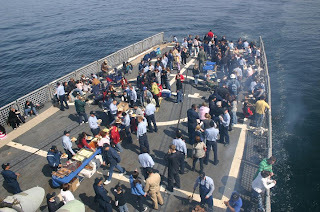 A steel beach picnic is basically where we put the grill out on the flight deck and barbeque. Chicken, steak, burgers, Cokes, etc. Just like a regular barbeque. The name is just a little bit facetious since we are obviously nowhere near a nice beach. Do you wear your uniforms? We wear civvies (civilian clothes). Shorts, tee shirts, sandals, that sort of thing. Photo of Family Day aboard the USS X, where they set up food like they would for a steel beach picnic. Is there room to play touch football on deck? What card games are most popular? Poker, spades, pinochle? I actually just got an email today about a dominoes tournament on the ship. But I only see the enlisted guys playing card games though. Normally I would not be allowed to just sit down and play cards with some random 19 year-old enlisted sailor because I am an officer. That would prolly be considered “unduly familiar.” The official term is called fraternization, which encompasses so much, I can’t explain to you in just one email, or even several. You can Google “fraternization” and “navy” or “military” and I’m sure you would get a million hits. UPDATE (7/20): Well as it turns out, its okay for me to play cards on the mess decks with enlisted sailors. And I did a couple times last week. How much clothing/personal effects do most of the crew bring along? And are you allowed personal computers and electronics, or is that all provided and public? We don’t have that much space to store stuff. A few jeans/pants and five or six shirts is about all of the room for civvies that we have. Of course we also have underclothes, hygiene stuff, ipods, laptops, movies etc. Some guys bring an Xbox or PS2. I bought a new ipod so I could put enough music to last me six months on it since I can’t get new music for a while. I brought a couple Spanish and Portuguese books too so I don’t completely lose my knowledge of them. There are computers scattered around the ship. Since I am an officer, I have more of them at my disposal. Coming Soon: description of living quarters, an update on duties, and why I cannot tell you the real name of the USS X (stay tuned, or else)! wow, cool! sounds neat :D i liked that part about the movies... haha! A) - i LURRRRVED amelia bidelia as a kid! B) - thanks for your comment on my Pooh card!